I just picked up a new food bowl for Bliss from her Daycare. I’m surprised how much it slows her eating. It’s made by Kyjen and is called a Slo-Bowl. Our kitchen looks like dog central as our new GSP puppy “Joy” is still learning to be well mannered like her big “sis!” At four years old I had forgotten Bliss’ more manic and destructive days. So for those with a new Weim puppy, take heart. With some patience and persistence your biting, non-stop Weim can grow into a regal, calm adult (most of the time). Breeder’s Note: We have talked about these type of food dishes before; however, in the midst of raising your puppy you might have forgotten. The habit of gulping food is not healthy; however, for the Weimaraner it can lead to deadly bloat. We also are encouraged by how well Katherine and Bliss have done. She told us she would have opted for another Weimaraner; however, her husband wanted the GSP. That sent her on a search to find a same quality GSP. That is another story. She did, and all is as they expected. 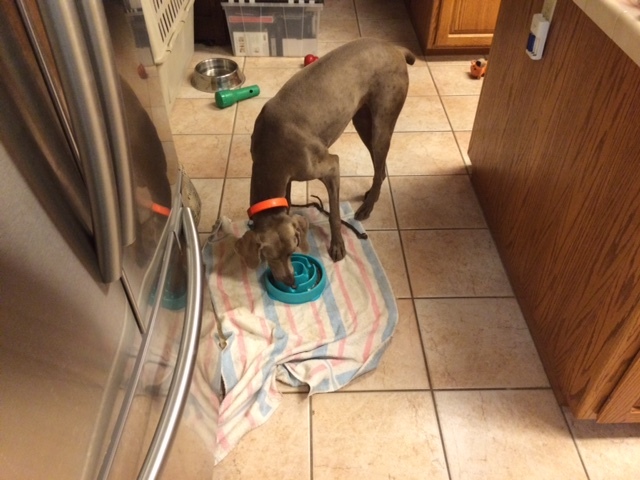 Posted on July 14, 2015, in Maggie X Zee, Previous Pup Update and tagged Bloat, Food Dish, Gray Ghost, Gray Ghost Weim, Gray Ghost Weimar, Gray Weimaraner, OwyheeStar, OwyheeStar Weimaraner, Slo-bowl, Slow Bowl, Traditional Gray Ghost. Bookmark the permalink. 2 Comments. I have seen the bowl you purchased. I think the bowl without removable parts would be better. :O) Weims are all about rearranging things. LOL Dr. No on four legs–hmmmm Yes, they were really surprised the GSP breeders were not doing a similar thing to what we do. I think sometimes people take it for granted until they discover otherwise. These are such find folks. They take great care of Bliss.